June played out similarly to May, in terms of the Genius Project. I didn’t make my minimum quota for the month of June. Spending an average of 60 minutes a day seems very easy to do in the planning stages, but when reality sets in… I don’t have a good reason for this — excuses, yes; but good reason, no. However, I did get more time in for the Genius Project in June than I did in May. I spent 26.75 hours on the Genius Project, which was 7 hours more than my May total. And more importantly, I spent a lot more time writing. 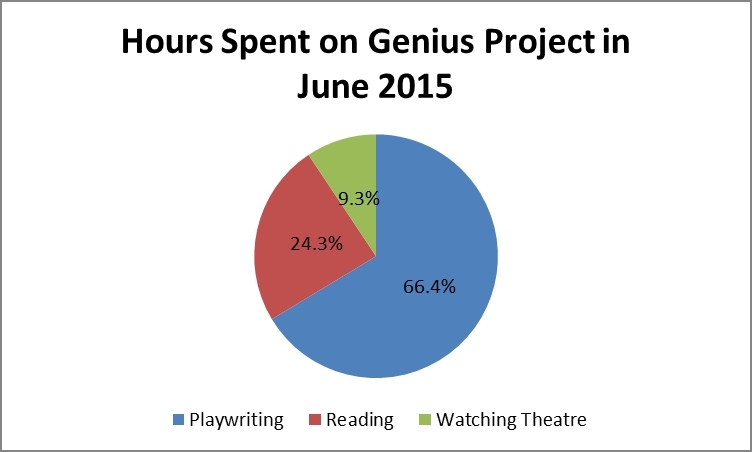 Not only did I spent 17.75 hours writing in June, but it made up 66.4% of my Genius Project related activities, instead of only 42% last month. I only saw one play in June, but it was another Shakespeare. It was actually a filmed version of a production of A Midsummer Night’s Dream directed by Julie Taymor. It would have been incredible to see it live, but the beauty of seeing the filmed version is that you get to see the actor’s faces close up and see the action from the best angles. Such a clever production! I read the book How to Fly a Horse by Kevin Ashton. The book discusses the myth of “genius” and it was very inspiring. Appropriate reading for the Genius Project! More about it in a later post. My project The Lost Years is still my main focus and it is going slowly. I usually find the first draft a bit challenging. I often try writing the first draft of a piece without an outline. So, I just write and see where the story wants to go. It’s not always the most efficient way to write, but it seems to be the most organic for me. Although this update is going out on the month end, I did start it at the beginning of the month. What happened? Ah, July… But that’s next month’s update, right? Hopefully, I will get July’s update out sooner than this June’s. Total hours spent on the Genius Project so far are 765.75. Only 9,234.25 more hours to go!